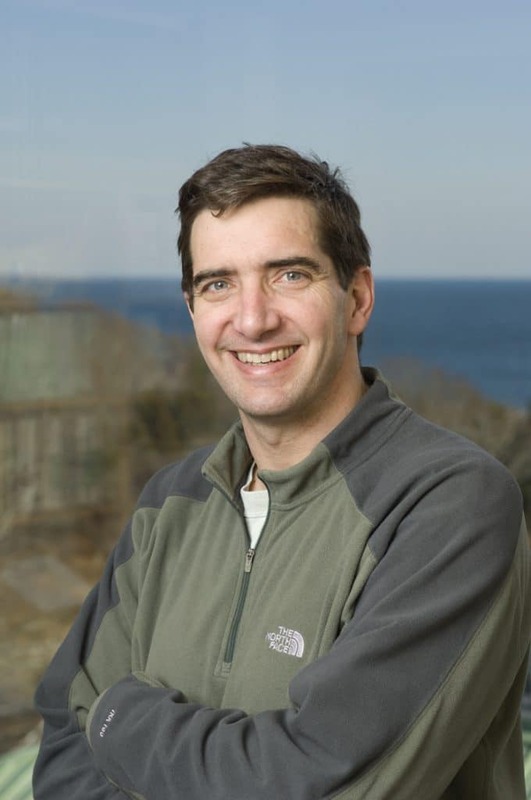 WHOI Senior Scientist Scott Doney has been awarded the 2013 A.G. Huntsman Award for Excellence in Marine Science. He will receive the award later this year at the Bedford Institute of Oceanography in Dartmouth, Nova Scotia. Since 1980, the Royal Society of Canada has granted the A.G. Huntsman Award to an oceanographer who has made significant contributions in the fields of marine geosciences, physical or chemical oceanography, or biological and fisheries oceanography. According to the A.G. Huntsman Foundation, Doney was selected because of his fundamental contributions to our understanding of the role of ocean biology in global biochemical cycles, his analysis of the vulnerability of ocean biological processes to global change – particularly ocean acidification, his leadership in bringing the community’s intellectual assets to bear on some of the most pressing scientific problems of our time, and for his tireless efforts to educate both students of oceanography and the general public on complex issues related to changes in the global ocean. “I am deeply honored by the award and the recognition of the important ocean research being done with my many scientific colleagues and students. Ocean science is increasingly a team effort, especially as we try to better understand and address the growing human footprint on the sea,” he says. Doney is also the Director of the Ocean and Climate Change Institute at the Woods Hole Oceanographic Institution (WHOI). His science interests span oceanography, climate, and biogeochemistry, with particular emphasis on the application of numerical models and data analysis methods to global-scale questions. Much of his research focuses on how the global carbon cycle and ocean ecology respond to natural and human-driven climate change. Ocean acidification is one of his current areas of interest due to the effects of carbon dioxide and other chemicals from fossil fuel burning on the ocean. He was the inaugural chair of the U.S. Ocean Carbon and Biogeochemistry (OCB) Program, and he is currently on the steering committees for the Ocean Carbon and Biogeochemistry Program and the U.S. CLIVAR/CO2 Repeat Hydrography Program. He is also a convening lead author for the Oceans and Marine Resources chapter of the U.S. 2013 National Climate Assessment. He received a PhD in chemical oceanography from the MIT/WHOI Joint Program in Oceanography. He was a postdoctoral fellow and later a scientist at the National Center for Atmospheric Research, before returning to Woods Hole in 2002. Other awards include the James B. Macelwane Medal from the American Geophysical Union in 2000, WHOI Ocean and Climate Change Institute Fellow in 2003, an Aldo Leopold Leadership Fellow in 2004, the WHOI W. Van Alan Clark Sr. Chair in 2007, and an AAAS Fellow in 2010. He has authored more than 200 peer-reviewed research publications and co-authored a textbook on data analysis and modeling methods for the marine sciences.